With the matter currently under review by attorneys for SFUSD, the Board stoked the flames of the smoldering situation when its members voted unanimously on October 9 to make an amendment to Lowell’s admissions policy. This revision is paving the way for students from one significantly under-enrolled and academically struggling middle school to gain admittance to Lowell in the hope that the policy shift might help to attract more applicants to this middle school. The admissions policy for Lowell has been the subject of controversy ever since it was put into place in 1966. In the early to mid-1960s, the number of applicants to Lowell began to exceed the capacity that the school’s physical structure could accommodate. To avoid over-enrollment, SFUSD instituted a GPA-based admissions policy. Since that time, variations of Lowell’s admissions policy have been debated within the SFUSD community and also challenged in court. The legal saga began in 1978 when the San Francisco branch of the National Association for the Advancement of Colored People (SFNAACP), along with a group of African American parents in San Francisco, filed a lawsuit against SFUSD, then-superintendent Robert Alioto, the San Francisco and California boards of education, the State Superintendent of Public Instruction and the State Department of Education. The SFNAACP charged the defendants with participating in racially discriminatory practices and maintaining a segregated school system in San Francisco. A 1983 consent decree settlement of the lawsuit provided that no racial or ethnic group could exceed 45 percent of the student body at any traditional school or 40 percent at any “alternative” school in San Francisco. As a result, in 1985, SFUSD implemented a race-based admissions policy at Lowell with the goal of creating a more equal distribution of ethnicities, as the school’s student body was largely Asian-American. Lowell was classified as an “alternative” school under this decree, and thus had to cap the number of students of any ethnicity or race at 40 percent. 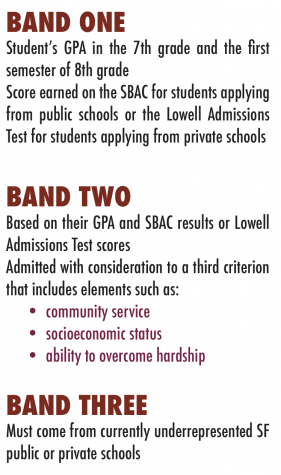 Given the significant number of Asian-American students attending Lowell at the time, these applicants would have to score significantly higher on the Comprehensive Test of Basic Skills and have a higher GPA than students of other races to gain acceptance to Lowell under this new admissions policy. By the 1990s, the 40 percent quota was becoming increasingly difficult for district officials to enforce at Lowell, given the dramatic rise in the number of Asian-American students then living in San Francisco who also qualified for admission to Lowell. Consequently, in 1993, the cutoff test score for admittance to Lowell for Asian-American students jumped to an all-time high, while scores for Caucasian, Latinx and African American students remained the same, resulting in dozens of Asian-American students being rejected from Lowell despite having scores well above those students in other racial groups. 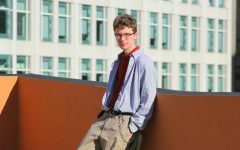 In a 1994 lawsuit, Ho v. San Francisco Unified School District, the Asian American Legal Foundation and a group of parents from the Chinese American Democratic Club challenged the use of racial quotas to limit the enrollment of Asian-American students in San Francisco public schools. As an outcome of the suit, SFUSD agreed to create a new “diversity index” system for admission to all public schools. 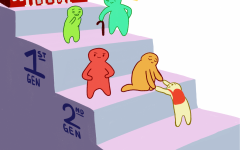 The “diversity index” would consider a variety of other factors, including socioeconomic background, mother’s educational level, academic achievement, language spoken at home and English learner status, rather than a student’s race. For Lowell, then-superintendent Bill Rojas proposed a new admissions policy, which entailed the establishment of a single academic entrance criterion for students of all ethnicities and races. However, in order to comply with a federal desegregation plan, about 20 percent of applicants to Lowell would come from families on public assistance and/or residing in public housing. This pool would be judged partly on their academic record, but also on involvement in clubs, sports, hobbies and community work. Rojas’ proposal was approved unanimously by the Board of Education in February 1996 and went into effect for the 1996-97 academic year. Under the new policy, all students would now be required to score 63 out of a possible 69 points to be admitted to Lowell, except for students residing in public housing or on public assistance, who would be required to score above 50 points to be admitted to Lowell. 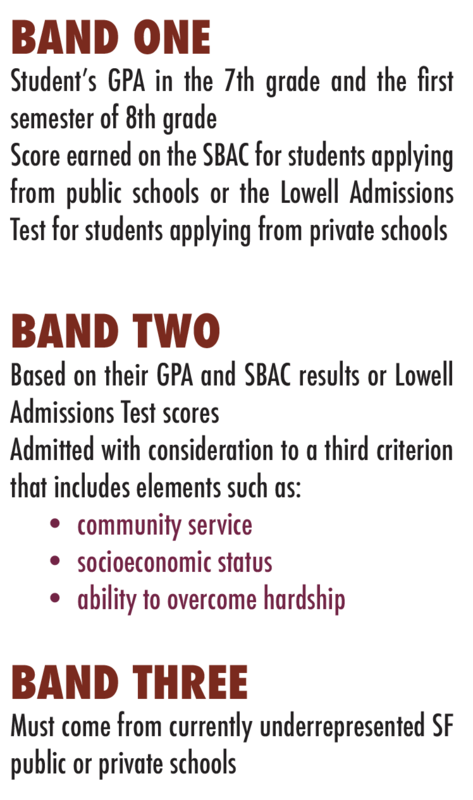 Through the current band system, applicants to Lowell can be accepted through one of three bands: Band One, through which 70 percent of incoming freshmen are admitted; Band Two, through which an additional 15 percent of incoming freshmen are admitted; or Band Three, through which the final 15 percent of incoming freshmen are admitted. 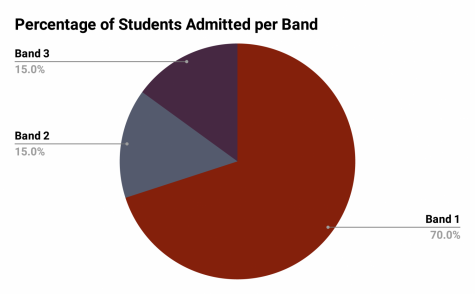 Band One admission is based solely on a student’s GPA in the seventh grade and the first semester of eighth grade, along with the score earned on the Smarter Balanced Assessment Consortium (SBAC) for students applying from public schools, or the Lowell Admissions Test for students applying from private schools. Students admitted through Band Two will also have been admitted based on their GPA and SBAC results or Lowell Admissions Test scores. However, with lower GPAs and test scores than students qualifying through Band One, these Band Two students are admitted with consideration to a third criterion that includes elements such as community service, socioeconomic status and ability to overcome hardship. 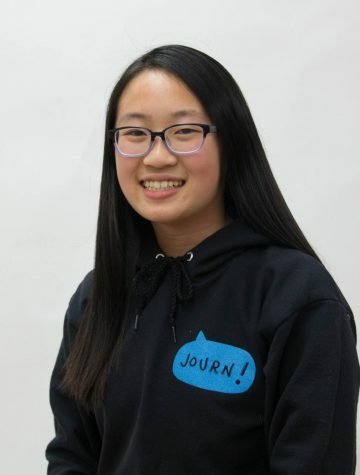 Students gaining admission through Band Three must come from San Francisco public or private schools currently underrepresented among the student body at Lowell. be accepted to Lowell regardless of their overrepresentation or underrepresentation at the high school. 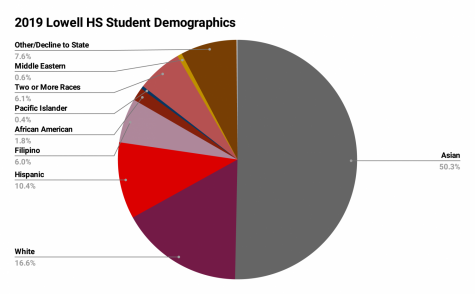 Data courtesy of Lowell High School. Data from the California Department of Education. 300 [382 per the most recent statistics from the California Department of Education]… So, I think that having this policy for Willie Brown will be really helpful over time to make it more diverse.” In February, Sanchez was already beginning to see such potential positive effects, with 100 students applying to Willie Brown for the 2019-20 academic year as opposed to the typical 60 students of previous years. 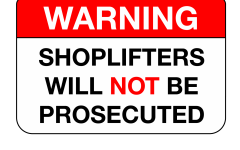 From the Board’s standpoint, Sanchez is confident that such concerns will not come to pass. “It’s such a small percentage of 10 or 11 kids so [the policy] will have an impact on Willie Brown in a positive way and it’ll be negligible on Lowell’s side,” he said. Now, more than halfway through his first year at Lowell, Liu, who has forged friendships through the Lowell Polynesian Club and his classes, feels comfortable at the school. 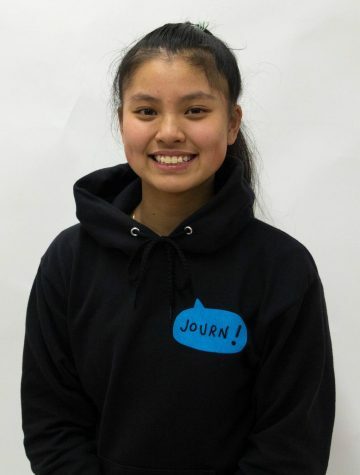 In an attempt to help ensure the success of the seven Willie Brown graduates joining the Lowell student body next fall, the Lowell administration will introduce to them, and other underrepresented students, three programs principal Andrew Ishibashi has established to help provide academic and social support to African American, Latinx, Filipino and Pacific Islander students. Since he joined Lowell in 2007, Ishibashi has been actively recruiting African American, Latinx, Filipino and Pacific Islander students. Every academic year, before applications to Lowell become available, Ishibashi reviews a list of every Latinx, African American, Filipino and Pacific Islander student in SFUSD who has at least a 3.0 GPA. He then sends letters to the families of those students, encouraging them to meet with him and have their student apply to Lowell. Ishibashi also assists African American, Latinx, Filipino and Pacific Islander families with their applications to Lowell. His efforts have paid off to some degree, with the number of Latinx students attending Lowell doubling since he became principal. 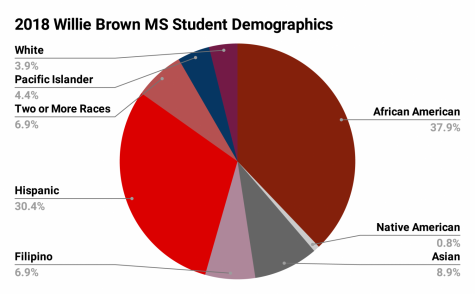 However, the African American, Filipino and Pacific Islander student population at Lowell has remained relatively unchanged. Although the debate has settled down for now, given the history surrounding Lowell’s admissions policy, it’s just a matter of time before the issue resurfaces. Finding a balance between academic rigor and racial diversity is a goal SFUSD and much of the Lowell community wants to achieve, but how to achieve that goal remains elusive.